Dear buyer, we will deliver your order by DHL express, so you can get it within 3-7days aiming to offer better shopping experience for this products. DSMART is an innovative brand who focus on developing smart wearable devices. With our years' professional experience , we will continously apply up-to-date technologies, and provide innovative, convenient to use, practical smartwatch for our customers to be your life, sports, outdoor activities partners. Watch size: Dia 51mm, Screen Size: 45mm, Thickness:14.8mm. Weight: 56g. Strap Length: min.145mm to max.215mm; Width: 24mm; Material: TPU. Screen: TFT 1.26Inch, 320*320 DPI . transflective alway-on, OGS touch screen. Battery: 450mAh Polymer battery rechargeable battery. Standby and Working Time: basing on usage, generally >2-5days . Compatibility: Smartphones IOS 8.0 and above, Android 5.0 and above. Functions: Pedometer, GPS, Compass, Barometer, Altimeter, Heart Rate monitor . Thanks for buying from DSMART. Any questions, please feel free to contact with us. 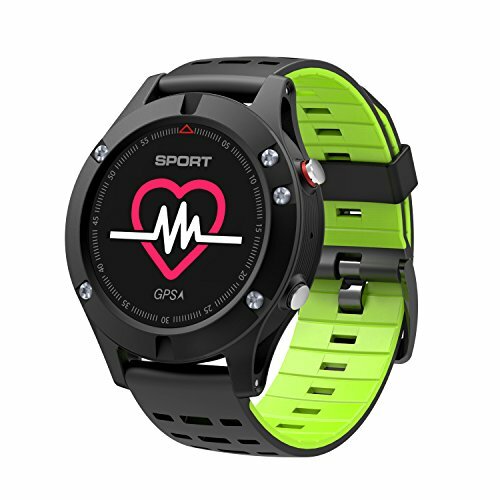 【Professional Sports Watch 】This GPS smart watch has advanced and up-to-date arlgorithm for different Sports, provides you professional tracking of Running, hiking, climbing, cycling, soccer, basketball etc. With built-in independent GPS chip for sports tracing as well as steps , distances , burnt calories, heart-rate etc. With ad IP68 waterproof, ultra-light Carbon Fiber case, durable Corning Glass cover, feel free to wear it for all indoor and outdoor sports. 【Outdoor Toolings】 With professional outdoor toolings such as GPS position, Barometer, Compass, and GPS also provides procise tracing for your off-road outdoor sports or explore a new city. IP68 Waterproof: free feel to wear if for swimming or boating, but not for deep diving. Please also do not wear it in hot water and press the button under water. 【Heart Rate Monitor】Dynamic & real-time heart rate monitor by advanced sensor, you can view your heart rate graph on the watch and know your body status better, so that to help you training more scientificly. (Not for medical use, for healthy reference only). And with Sleep monitor and Sedentary remind for your daily healthy. 【Convenient to Use】With professional App to manage all your sporting activities, convenient for you to check anytime without cellphone. Bluetooth 4.0 to compair with all Android4.4 & IOS7.0 or above Smartphones in seconds within 10 meter . Timely syncs the incoming calls , SMS , app notifications push, you will never miss any importance.